Thursday had some definate problems in scheduling when Twilight's New Moon was set to follow Disney's 3D panel and James Cameron's Avatar panel. The reason for concern arised when fans remembered last year when Twilight fans camped out over night to be the first people in Hall H. This is all well and good, but Twilight fans took up a lot of space and forced some people to miss panels they would have otherwise not missed if it were not for Twilight fans taking up seating space in Hall H. To quickly avert this happening again, the James Cameron Avatar panel will now follow Summit Entertainments panel including New Moon. This should allow for both fans of the Twilight Saga and people hell bent on catching a glimpse of Avatar to get a decent shot at seeing the panels. What Comic Con didn't change was Disney's 3D panel including Alice in Wonderland. So sorry Wonderland fans, you are going to have to fight off Twilight fans for a spot in Hall H Thursday morning. So James Cameron's Avatar panel is now scheduled for 3pm and Summit's panel is now at 1:45pm. 3:45-5:00 Sony Pictures Entertainment: Legion and District 9— Sony Pictures Entertainment and Screen Gems introduce two great new movie projects exclusively to Comic-Con attendees! Legion—When the last angel falls, the fight for mankind begins. Having lost faith in the human race, a legion of angels descend to Earth to bring about the Apocalypse. Humanity's only hope lies in a group of strangers trapped in a desert diner and the Archangel Michael himself (Paul Bettany). Appearing on stage: Paul Bettany (A Beautiful Mind, The DaVinci Code), Adrianne Palicki (Friday Night Lights, Supernatural), Tyrese Gibson (Transformers, Death Race), Doug Jones (Silver Surfer in Fantastic Four: Rise of the Silver Surfer and Abe Sapien in Hellboy), and director Scott Stewart (helming his first feature film after working on VFX for Sin City, Harry Potter and The Goblet of Fire, and Iron Man, among many others). From Screen Gems. 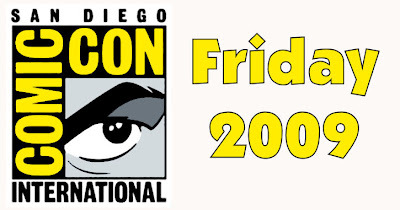 To see Friday's full schedule head over to Comic Con's official site.